Our hand-made hats ship in 6-8 weeks. 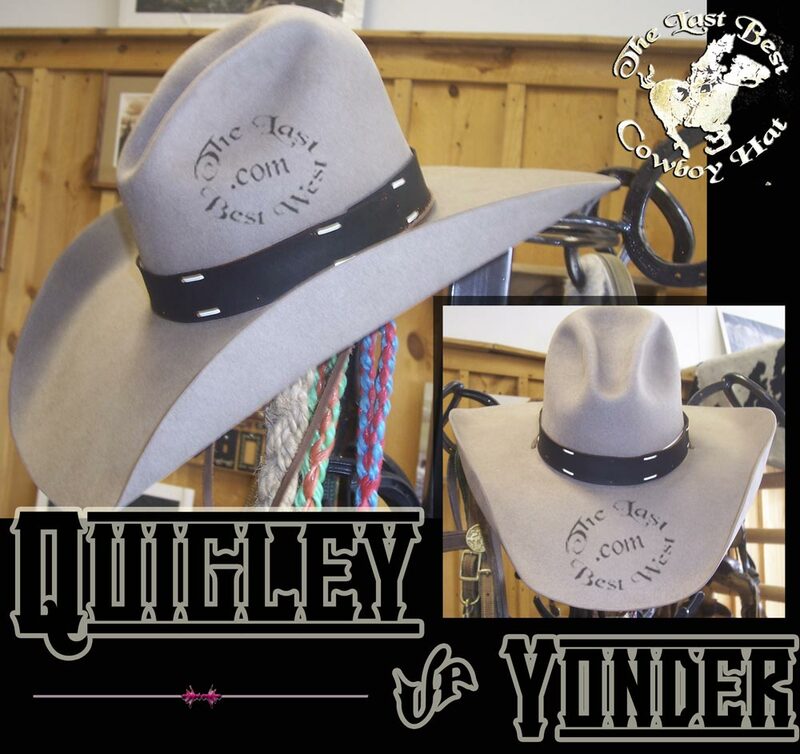 Purchase one of our fine beaver-blend hand made cowboy hats and you will receive the same quality and workmanship that is worn by more than a dozen of the world’s premier rodeo cowboys riding today. Production Companies, Marshals, Sheriffs, Musicians, Writers, Cartoonists, Artists, Athletes, Soldiers, and lots of every day folk love our hats, and we hope you will as well. Teea Goans signing our Nashville stars hat. Most people know that putting a cowboy hat on a bed is bad luck – but why do cowboys feel that way? Well first off a cowboy would never wear his hat in bed and he’d only be in bed during the day if he was sick. So by putting your hat on the bed you risk bringing sickness or other bad luck on yourself. 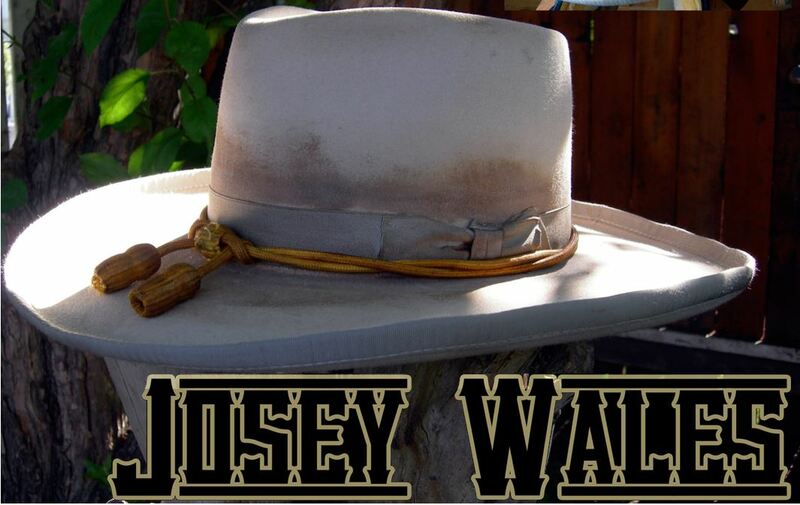 Our hand-made cowboy hats are made the old west way – one at a time, starting with the best fur-felt hat body available – made in the USA – and fashion as fine a hand-made cowboy and dress hat as you can find anywhere, for any money. You’ve worn the rest, now own the best! Your name stenciled on the sweatband tells the World you have a custom hat! Beaver Fur Felt is dense and virtually waterproof. It consists of beaver and rabbit/hare fur blended with felt to produce a material that lasts 5-10 times longer than wool-felt. What makes it so exceptional is the beaver hair has a barb on the end like a fish hook, and as a consequence the beaver fur in the hat body meshes together, making it strong and rigid. 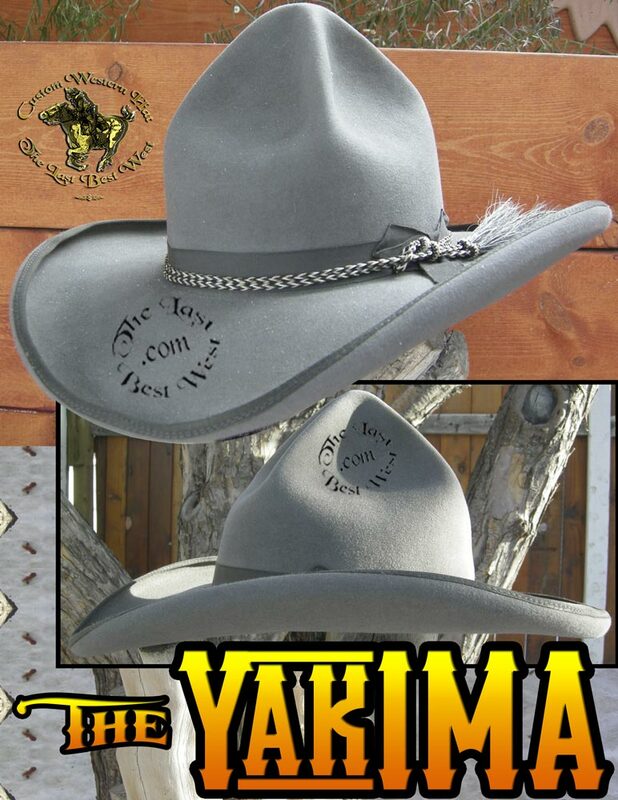 A fine Beaver and Beaver blend fur-felt hat can be re-blocked and shaped numerous times, and is the best material from which to manufacture the best custom cowboy hats. As a general rule of thumb if a hat maker only describes their hat bodies as fur-felt, chances are it’s rabbit or Hare. Hat makers who use beaver fur-felt are proud of it and will state so. 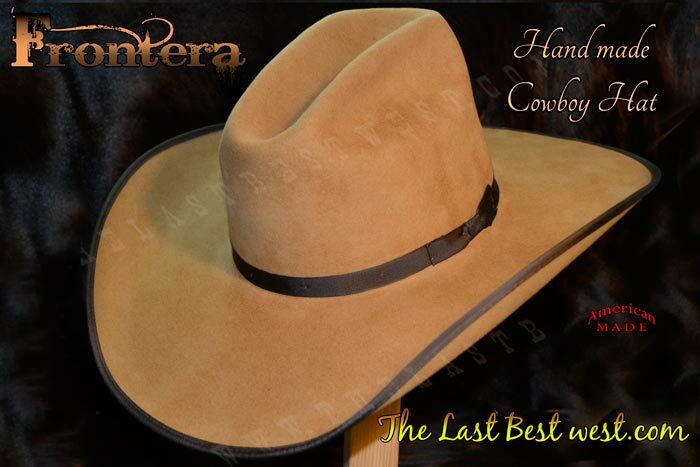 We sell 3 quality beaver blends of fine western hats – 5X, 20X and 100X. 5X is a blend of about 5% beaver with rabbit and felt. Our 20X is 50% beaver and our 100X is pure 100% beaver fur-felt. 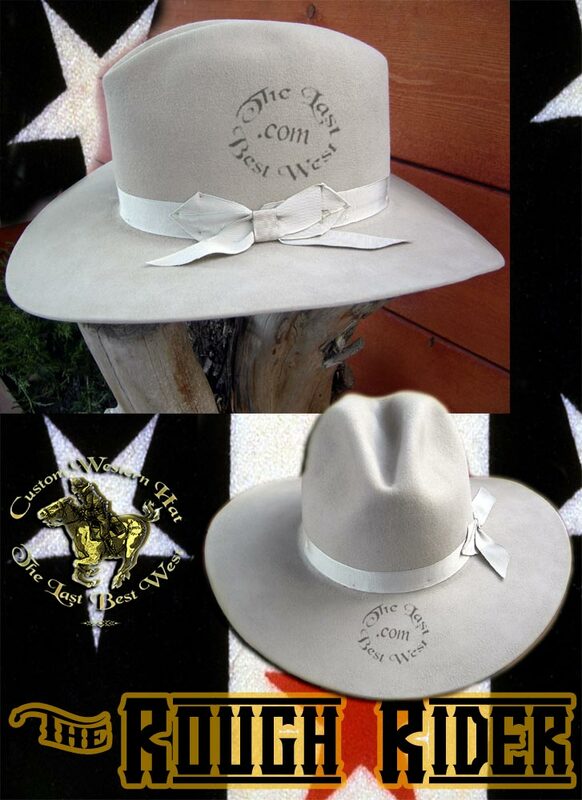 The rough hat bodies we use to make our cowboy hats are the best available and made in America. For an all weather hat you can’t beat a pure beaver cowboy hat. Light, stiff and fabulous looking it’ll shed whatever comes its way. And consider this: Beavers live in the water, rabbits in the dirt. It has been our honor and pleasure to make our fine working hats for Peace Officers, State Troopers, Sheriffs, Marshals, Officers, Soldiers and Security Contractors. So rest assured our Last Best Cowboy Hats will stand up to any and all rain, snow, and scorching sun you may have to put it through. We make working hats for working people, and our hats are dye fast and will not fail you when the going gets tough, and the weather turns from bad to worse. 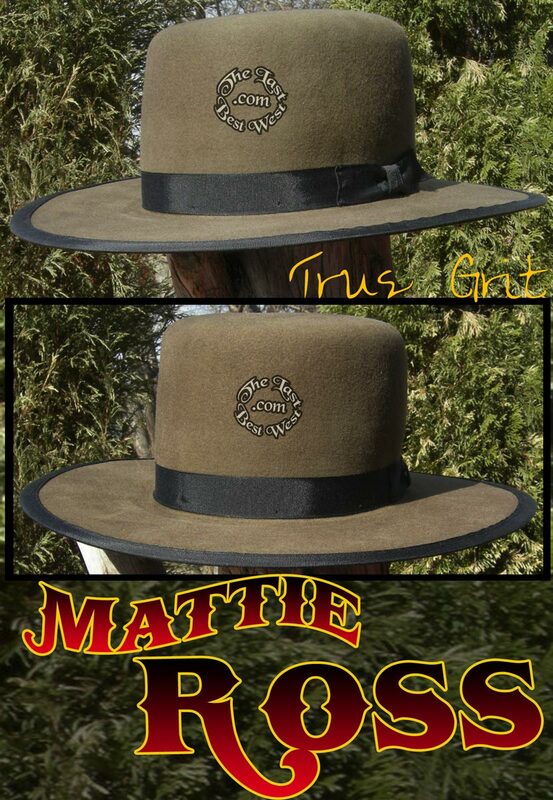 All our hatbands that ship with our hats are stitched in place, and are easily removed with a couple of snips. But the beauty of our line of hand-made hatbands is they simply slide over the existing satin ribbon and bow, to give a new and different look to your hat. One hat 2 looks! 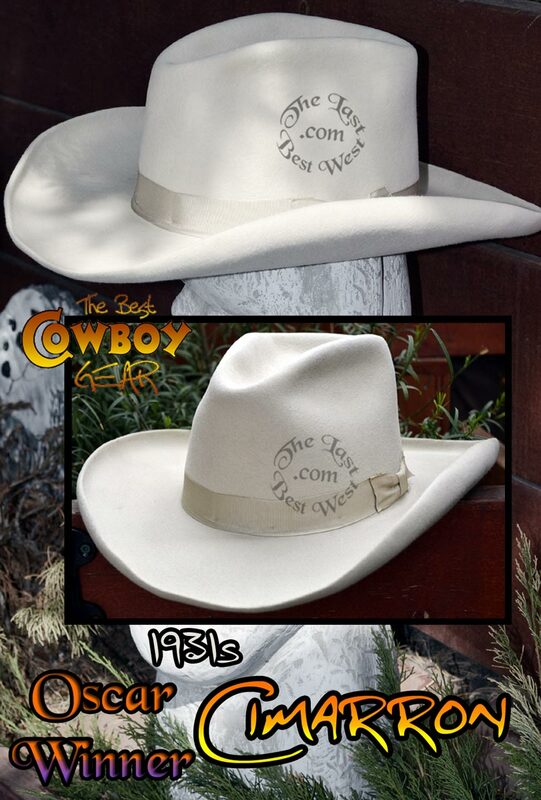 We make hand-made custom cowboy hats so the crown and brim measurements are pretty much redundant. The hats you see online are our standard hats, which have specific crown heights and brim widths to maximize the look of that particular style or hat design. We can make up to a six (6″) inch crown and a five (5″) brim. Any hat with a brim width of more than 4 inches we must start with an oversized hat body, which adds a little to the cost. However the oversized brim can give you up to 50% more sun/bad weather protection, than a regular hat body. 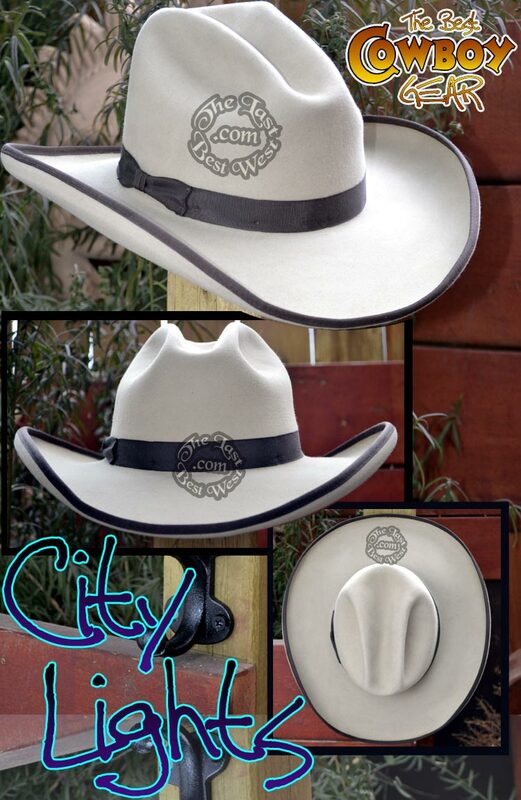 Most of our cowboy hats have a crown height between 5 and 6 inches and a brim width of 3 1/2 to 4 inches. 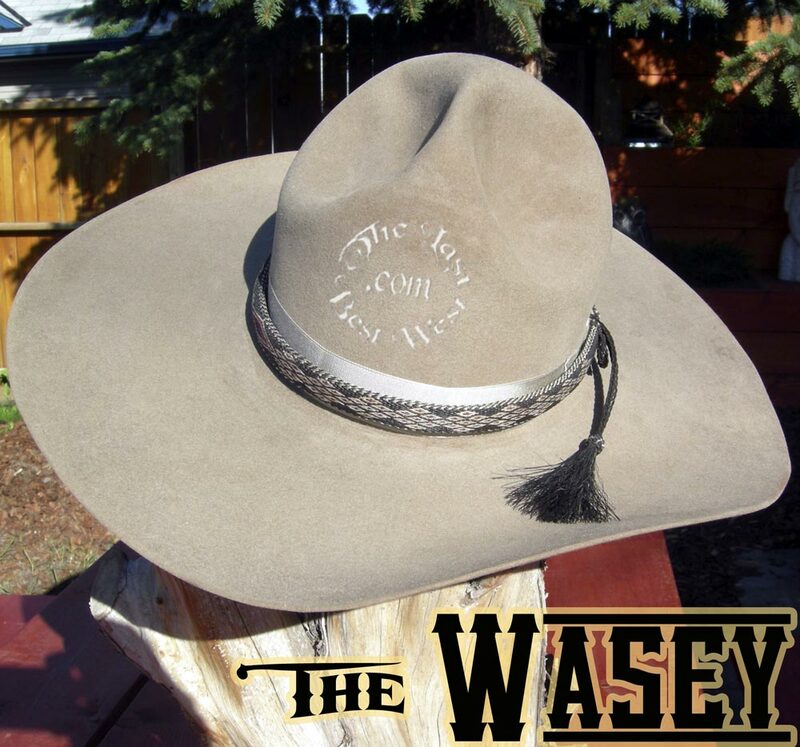 Cowboy Hats with a wider brim include The Wasey, Quigley, Everett Hitch, Blondie, Little J, The Dunson, Last of the Dogmen, Wild Bill, all our B-Movie hats, and many of our Custom Rodeo Hats. Color variances caused by individual computer monitors are beyond our control. Light colors will reflect heat the best – while dark colors will retain heat the most – with black being the worst for staying hot (black absorbs sunlight). However black is the most formal color so bowlers and top hats were generally black or dark gray. For the first 15-20 years cowboy hats were marketed – your choice of color was black and about 3 shades of brown. Please keep in mind we try to take our pictures with natural light – so differences between the same color reflects the difference in light when the picture was taken: Indoors, Outdoors, Sunny Day or Cloudy. Starting with the lightest and going to the darkest, here’s our colors. Click on the color to see a hat example. IF YOU GET VOICE MAIL PLEASE LEAVE US A MESSAGE! 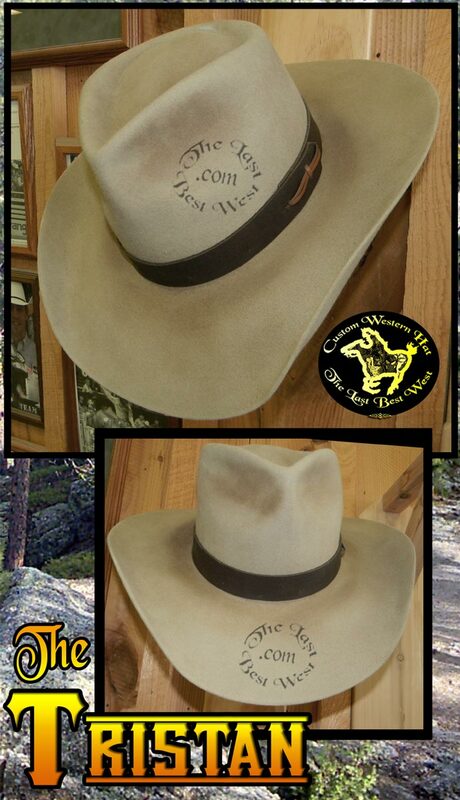 Many custom cowboy hat customers have been requesting that we dirty up their new hats to make them look trail worn. 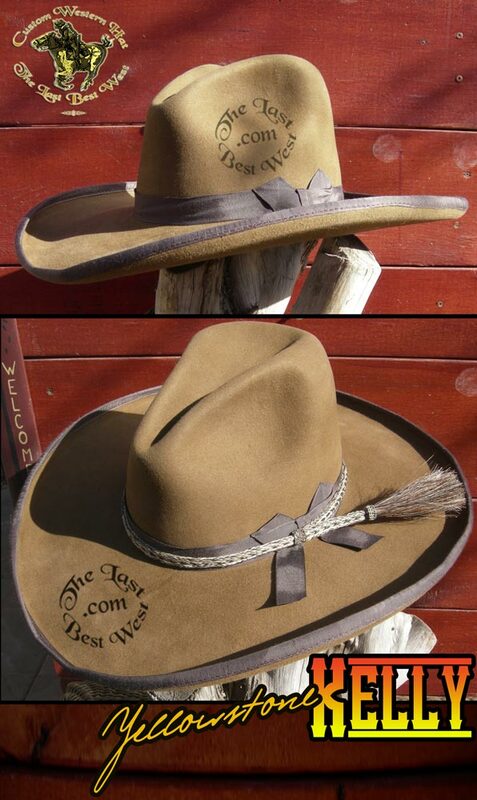 Pictured is a dusty Tristan – our Tristan hat with a couple of years worth of soiling to give it that Buckaroo lived in look. We’ve got three different degrees of trail dust. Light (add $55.00) – medium (add $75.00), and heavy (add $95.00). Light would be what you see on our BOSS SPEARMAN, medium would be like the dusting on the TRISTAN, and heavy trail dust looks like our JOSEY WALES. This is a similar process that costume designers apply to hats in the movies and TV. 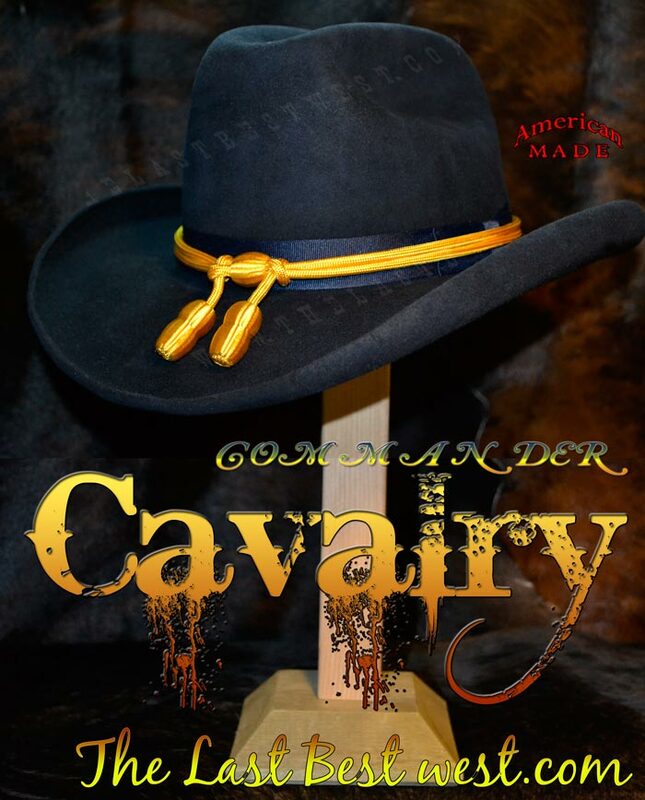 Looks authentic and your friends will swear you just got off a trail drive, or a hitch in the Horse Cavalry! You can add trail dust during the check out process – or request it when you call your order in. 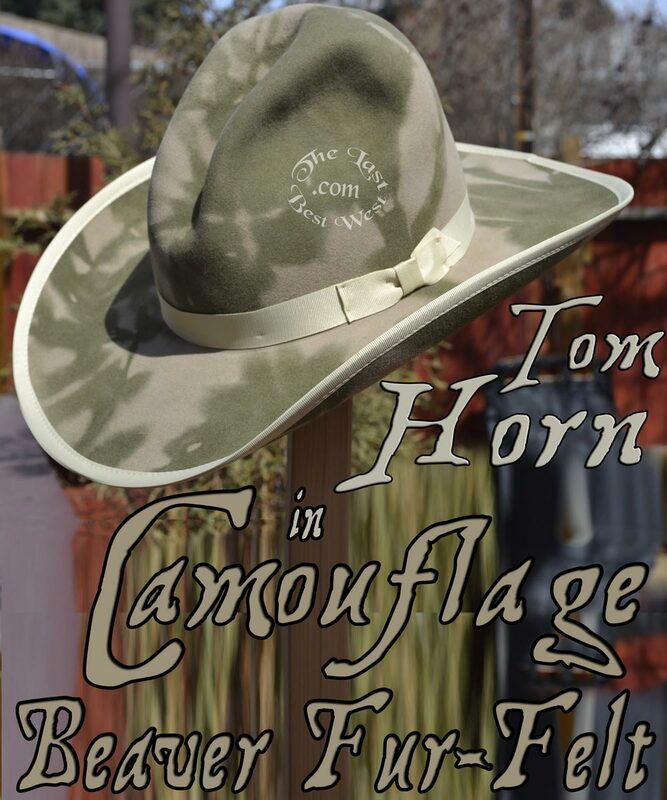 The 1898 Bow – a classic cowboy hat bow style from the 19th century. This was the most common bow style of the 19th century. If you prefer this bow style for any of our hats, just request it when your hat details are confirmed via e-mail. Q: I’m looking for a __Cowboy Hat. I checked your product catalogue and didn’t see it. Can you make it? A: Yes. As I’m sure you can appreciate it’s just not possible to show all the different variations of crowns and brims. If it’s made from fur-felt and you can supply us a good picture – yes we can make it. Generally we already carry the same style of hat, we just shape it based on the photo or if it’s a movie hat we shape it from watching the movie and seeing the hat from all possible angles to get the look just so.